The Schaffner Group is a global leader in solutions that ensure the efficient and reliable operation of power electronic systems by shaping electrical power. The company's portfolio includes EMI filters, power magnetic components, power quality filters and the related services. Schaffner components are deployed in electronic motor controls, in wind power and photovoltaic systems, rail technology applications, machine tools and robots, electrical infrastructure, and in power supplies for a wide range of electronic devices, such as in medical technology. Better power quality means greater benefit, preventing additional costs and damage to sensitive equipment. This can be through variations (spikes, dips) in voltage, fundamental frequency and voltage shape (harmonic distortions) or high-frequency noise occurring sporadically or repeatedly, impulse-type interferences, or impedance in energy transfer installations. Demand for electrical energy and expectations regarding the efficiency of electronic systems continue to rise around the world.Core markets- automotive electronics, rail technology, energy efficient drive systems, power supplies for electronic devices, machine tools and electromobility. PCB EMC/EMI filters, IEC inlet filters/Power entry modules, DC filters, Single-phase EMC/EMI filters, Three-phase EMC/EMI filters, Three-phase and neutral line EMC/EMI filters, Open frame EMC/EMI filters, EMC/EMI chokes, Feedthrough filters and capacitors, Pulse transformers, Customized solutions. Line filters and reactors , dv/dt filters and reactors , Special Reactors, Sine wave filters, Ecosine Active harmonic filters and Ecosine Evo (the new generation passive harmonic filter), Regen reactors and filters, Transformers & Voltage stabilizers, Customized solutions. Schaffner is uniquely able to offer both passive harmonic filters and active harmonic filters (can work upto 50th harmonic) for the efficient mitigation of mains harmonics. 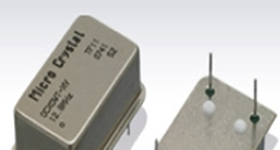 EMI filters-HV DC filter and LV DC filter, Inductors for Power Electronics, Indoor keyless locking antenna, Electronic immobilizers antenna and Tire pressure monitoring systems. 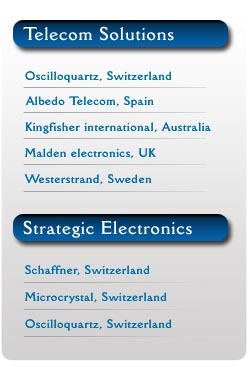 MICRO CRYSTAL, a Company of the Swatch Group, Switzerland, is a leading manufacturer of Miniature Tuning Fork Quartz Crystals (32kHz to 250MHz), Real Time Clocks, Oscillators and OCXOs for the world's leading manufacturers of mobile phones, consumer products, computers, automobile electronics, watches, industrial controls, as well as medical implantable devices and other high-reliability product applications.